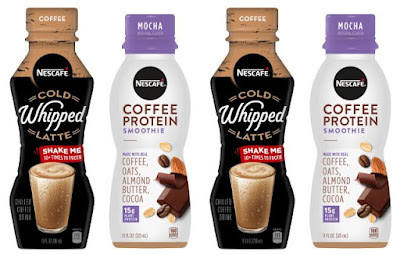 Nescafe enters the ready-to-drink coffee market with the upcoming launch of two new products: a coffee protein smoothie and a whipped latte that you shake to froth before drinking. 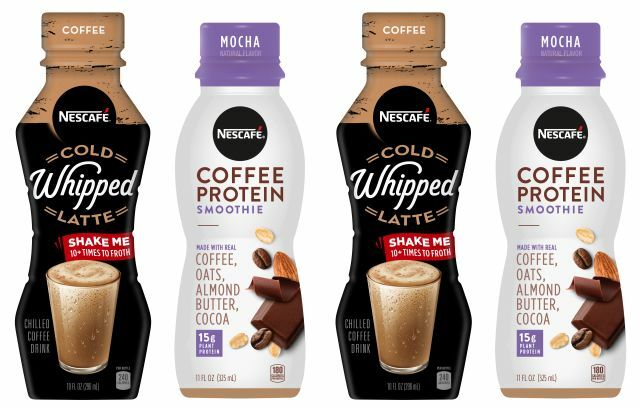 The Nescafe Coffee Protein Smoothie features a blend of Colombian Arabica coffee, oats, and almond butter. Each 11-oz single-serve bottle is good for 15 grams of plant-based protein. It's set to arrive starting in January 2019. Each bottle carries a suggested price of $3.49 and will be available in Banana and Mocha flavors. The Nescafe Cold Whipped Latte features a frothy blend of coffee, milk, and various flavors with what they're calling a "unique foaming technology" to deliver the texture of a latte. The latte will come in single-serve 10-oz bottles beginning in January 2019 with a suggested price of $2.49 per bottle. It will be available in Coffee and French Vanilla varieties.